Our Erie tributaries usually freeze during the winter. However, recently warmer temperatures allowed for the ice to break loose and bring current in the system. This has given us fishable water in Erie’s tributaries for the time being. Given the current forecast I’m betting that we have fishable water for at least another week and a half, if not longer. Most of the record snow that fell in December is gone. 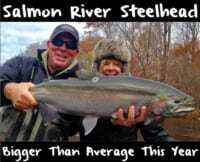 Steelhead fishing is good right now and fishing pressure isn’t too high. The rain and snowmelt has brought a slough of fresh fish in tributaries. The fresher fish are on the smaller side, but there are still larger fall fish in the systems. Your typical spring run fish in Pennsylvania are 22-24 inches and we are seeing a fresh push of those now. 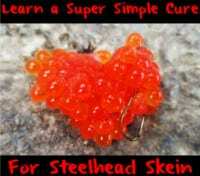 Almost every Lake Erie tributary from Ohio to the New York border has steelhead right now. The older fall run fish are higher up in the systems, whereas the fresher spring fish are in the lower sections of the creeks. During the winter if you have good bait, proper gear and patients I’d expect to catch double-digit numbers of fish. That number decreases if the weather gets bad. This past weekend I was using mostly Natural BorX O Fire cured spawn sacks fished in pink and peach netting. Keep in mind the top colors for netting change daily. To me it’s all about water color. This week it was a nice, deep green color, which is why these lighter colors work so well. If the water dirties up I’ll switch to an even brighter color like chartreuse netting. My average sack is filled with five-to-seven BorX O Fire cured eggs. If the water clears more I’ll drop by to three to five eggs per bag. Float fishing has been the most productive method. I’m using a small clear or black and orange float with a small black micro swivel. Then I’ll run a 20-inch, four-to-six-pound fluorocarbon leader and a size 12 hook. Because the water is so clear if you use line heavier than six-pound test you risk losing bites because these fish are line shy. The bite should remain good unless we experience a drastic drop in temperature or a large front moves in. As long as we don’t get a deep freeze or a bunch of rain that would blow out the creeks fishing should remain good for a while. Keep in mind we want the temperature to remain around freezing. The fish will bite when it’s colder, but I’m more concerned with the creeks freezing up. It needs to be much colder than that to freeze moving water.